Ko Kood or Ko Kut as this piece of paradise is known, can only be described as wild and wonderful. In part due to the island's vast virgin tropical rain-forested interior, which is mostly smothered in slender swaying coconut palms and rubber plantations but also in part due to its outlying location close to Khmer territory near Cambodia on the eastern side of Thailand. Many of the inhabitants living here still have some Khmer blood running through their veins, as both Thai's and Cambodians who were once resident in Cambodia, fled the French control at the turn of the 12th century and settled on Ko Kood. Islanders number less than 2,000 and make most of their living from fishing or the cultivation of coconut palms as well as the collection of rubber from the boundless plantations on the island. The most populated area of Ko Kood is at Ban Khlong Hin Dam which also doubles up as the administrative centre of the island. You will find a police station, a hospital, a school and the island's main temple but little else. The village is just two kilometres eastbound from the main Hin Dam Pier on the western side of the island and 9 kilometres southbound from Ban Ao Salat Pier on the northern side of the island. I suggest you go to Ko Kut Natural opposite the hospital for the best source of information regarding the island. The English teacher and computer specialist here will help you get settled. While you are here, you can access the internet, rent a motorbike or mountain bike as well as hire imported sea kayaks. Don't forget to pick up a free map of the island showing all the best beaches, waterfalls and more importantly the island's road system. Albeit the roads are few, narrow, unpredictable, concrete in places, then right on down to mostly dirt and stone trails. Although Ko Kood is 25 kilometres long and 12 kilometres wide while covering some 105 square kilometres, there is only a grand total of around 20 kilometres of concrete roads then again alternated by gravel and sandy tracks. Exploring the island by foot can be a rather pleasant alternative. 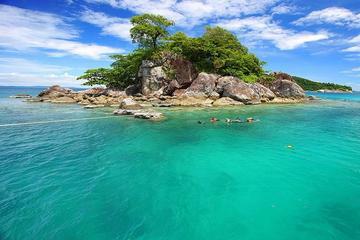 Koh Kood is the fourth largest of Thailand's islands and the second largest of the 52 island archipelago located in the province of Trat on the east coast of the country. Ko Kood lies just south of Ko Chang and is considered to be one of the perfect places for lovers of nature as it retains a somewhat sensual beauty. Not only because of its natural forested interior, but also the island has simply not become overly commercialised. Yet that is. Substantial parts of the plains are still wonderful, wicked and wild. Oh! How I enjoy this phrase... I just have to say it again. Wonderful, Wicked and Wild. This particular phrase surely sums up many aspects of life in Thailand. Wild tropical jungles. Wild thunderstorms. Wild parties. These are just some thoughts I'll leave you. Well, now where was I... Oh! Yes! Wild was it not. Towards the southeast interior of the tropical rain forest here is Khao Phaenthi, the highest point of the island at only 315 metres. It's a wonderful area to explore on foot, especially during the cool season between November and February as refreshingly light breezes prevail on most days. Towards the north of the interior near Ban Chum Phon, you'll discover a five-hundred-year-old Maka tree known to the locals as the Dtohn Maai Yai or Nariphon. It stands tall at some 35 metres or more. Lianas and epiphytes hang from its branches but more than that, this mysterious tree bears fruit in the shape of young women. See the photo at the top of this page. To reach the Maka tree, you'll need to take the one-kilometre path from Ban Chum Phon which runs through the forest and rubber plantations. It requires some navigation so it's best to take a local guide to show you around. Lying 82 kilometres from the coast of Trat Province on the Gulf of Thailand is Ao Klong Chao Bay on the west coast of Koh Kood. You'll easily recognise Ao Klong Chao Bay near the southern end of the west coast of Koh Kood on the map at the bottom of this page. The 4-Day and 3-Night tour described above is where you could be heading this winter. Koh Kood is the epitome of an island hideaway featuring uniquely designed and spacious bungalows with private terraces and ocean views from almost every room. The resort here offers a full range of recreational activities and facilities and has the largest activity and dive centre on the island. Not only do you get to enjoy the beauty and tranquilness of the resort, but also everything else the natural hideaway island has to offer. You get all this and more should you wish to discover another side of Thailand and its islands. Booking your tour here (at no extra cost to you) would not only give me a little pocket money, but you'd be helping me maintain this blog so that I can continue giving you more Thailand info. The interior also provides refreshing freshwater pools from several waterfalls where you can enjoy a leisurely swim. The best-known one is the three-tiered Nam Tok Khlong Chao waterfall accessible from Ao Khlong Chao beach via a canal and towards the north-west you would stumble across the three-tiered Nam Tok Khlong Yai Kee waterfall, accessible via a short steep path. Ao Taphao is considered the most popular beach on Ko Kood, located on the western side of the island near the Hin Dam Pier. It's a wonderful stretch of coastline with soft white silky sand and a background of sweeping coconut palms. It's peaceful and relaxing with fabulous sunsets to enjoy. From here you can take a stroll to all the nearby inlets and bays. The beach is conveniently situated near the administrative village of Ban Khlong Hin Dam as I mentioned earlier. Ao Klong Chao a little further south but still on the west coast, is a long bay separated by a canal. This pleasant beach is quite safe for swimming. Tucked away in the jungle close by is the Nam Tok Klong Chao waterfall which can easily be reached by trekking along the canal or by kayaking through a lush mangrove forest. The waterfall cascades down into a large pool and provides a welcome spot for some freshwater swimming if you so wish. Ao Khlong Yai Kee is a winding bay situated on the mid west coast consisting of a 500-metre long beach where you can enjoy some scuba diving or perhaps kayaking through the mangrove forest in the area. There is a great observation point where you can view the small island of Ko Raet as well as witness some amazing sunsets. Nam Tok Klong Yai Kee waterfall is situated four kilometres inland and accessible by road from nearby Ban Khlong Mat. Ao Klong Mat is a quiet beach situated slightly further south of Ao Khlong Yai Kee and very close to the small village of Ban Klong Mat where you will find the island’s oldest fishing community. The locals here offer a warm welcome to tourist as it gives them a chance to sell some of their souvenirs. If you want to know just where to stay on the island from the most luxurious resorts to the more (depending on your budget) affordable ones, take a look at some of the reviews I have compiled for your convenience on my hotel page.